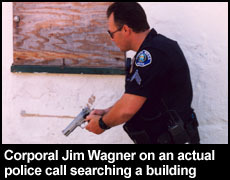 In 1993 officer Jim Wagner saw a notice on the police bulletin board. It was a vacancy for a SWAT officer. 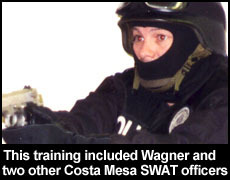 Vacancies on the Costa Mesa Police SWAT Team were rare. SWAT is an acronym for Special Weapons And Tactics. Most team members typically stayed on the team anywhere from five years to ten years. Jim recalls, "Ever since my first days in the police academy I knew that I wanted to be on the SWAT team. When my opportunity came I tried out for one of the open slots, as did a dozen other guys. I remember it vividly because the SWAT Physical Agility Test was on my 30th birthday, and my wife had a huge party planned for me at my martial arts school that I owned and operated on the side – The Academy of Fighting Arts." Describing that eventful day Jim Wagner said, "The day of my testing was a sizzling breezeless July day, and the test did not get underway until late morning, which meant that the coolness of the morning had long disappeared. None the less, I was energized and I was aced everything. I did my 10 pull ups on the chin up bar. I dragged the 170 pound dummy 40 feet. I did my 60 push ups and immediately rolled over to do my 60 sit ups to get maximum points. I ran around the one-minute-or-less obstacle course leaping the walls like a gazelle and weaved myself around the pylons like going through like a slalom course in 56 seconds. If this were not enough, we applicants had to run up a flight of stairs, three stories high, within 15 seconds and ring a bell mounted at the top of the banister. Then, to finish the testing, we had to run a mile and a half on the cooking rubberized track. I hate long distance running. I hated running in the Army, I hated it in the Academy, and I dreaded it on the day of the SWAT test; especially timed runs. I ran my heart out, but I was 40 seconds too slow according to the examiner. He looked at me and said unemotionally, 'Sorry, you didn’t make it.' I shook my head in acknowledgement, found myself a bench in the shade, and then let the heat slowly evaporate from my body. Fortunately, my birthday party that night lifted my spirits." Officer Jim Wagner was discouraged, but not defeated; he applied the following year when there was another two openings on the SWAT team. This time he was determined to push himself harder on the mile and a half run, and he crossed the finish line under the allotted time. He went on to pass the rigorous shooting test conducted by Range Master John Burgner, which consisted of a hostage situation using projected images on a live-fire screen. A few weeks Jim sat across the desk of Lieutenant Ron Smith and was handed a silver plated SWAT badge for his patrol uniform and told, "Welcome to the team. You’re in." The lieutenant handed him an equipment list that was taken down to the Property Division where he was issued a Kevlar helmet, Battle Dress Uniform, boots, tactical vest, and the whole kit. 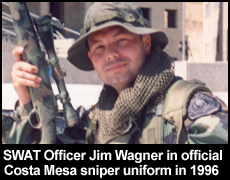 After only two years and nine months as a patrol officer, and two years as a corrections officer before that, Jim Wagner was officially on the Costa Mesa SWAT Team on March 11, 1994. He would end up serving for three years, two months, and 13 days. 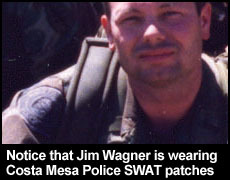 On May 24, 1997 Jim Wagner resigned from the team and was awarded a SWAT plaque, which is given only to those who have served honorably on the team. The award was approved by Swat Commander Ron Smith and presented by his first Field Training Officer, and fellow SWAT Officer, Phil Myers. 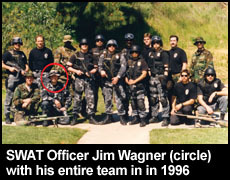 Years before being placed on the SWAT Team Jim Wagner had set up realistic training scenarios for the SWAT Team. This direct contact with the team gave Jim the opportunity to learn their tactical techniques and training methods long before he was required to learn them. 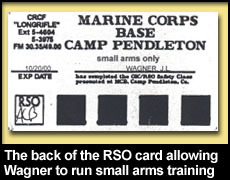 Also at the time Jim had been training heavily with outside military units and law enforcement agencies, mostly at Camp Pendleton and surrounding areas, since 1992 and was even being asked to instruct defensive tactics and tactics courses outside of his own department. This gave Jim many innovative organizational and training ideas, which he shared with the new SWAT commander Lieutenant Ron Smith, who replaced Lieutenant John Fitzpatrick. 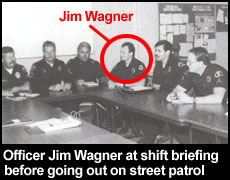 It was Lieutenant Fitzpatrick that first utilized Jim’s tactical diagramming skills during a SWAT call-out, even though Jim was just a patrol officer at the time, and then Officer Wagner with the SWAT Perimeter Team when an entry was inevitable. Lieutenant Smith was keen of Jim's ideas and was instrumental in Jim’s SWAT tactical career. 1. Reconnaissance – gather intelligence information (by means of observation, tactical sketches and photography) without detection in the kill zone. 2. Initial Planning & Coordination – provide the SWAT commander and Intelligence Officer with information gathered at the kill zone to aid them in identifying required actions for the mission. 3. Security Element – provide security at Command Post (CP) or in danger areas when assigned. Jim Wagner's primary duty was to be the first officer to scout out the target area, gather intelligence, and then create the tactical diagrams that would be later used by the entire team. The SWAT commander would use the tactical diagrams for decision making and the Entry Team would study them before making forced entry. Of course, good intelligence gathering and accurate tactical diagrams are vital for the safety of the Entry Team. It’s not merely drawing a few lines on paper, but a good operator must understand what the interior layout is based upon vents, chimneys, ventilation pipes, windows. The discipline is also about knowing wall structures, door types for breaches, and obstacles and barricades. 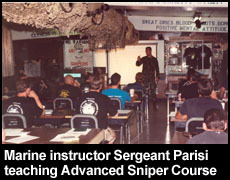 One of the courses Lieutenant Ron Smith sent Officer Wagner to in order to perform his duties was INTRODUCTION TO TACTICAL DIAGRAMMING presented by the National Tactical Officers Association (NTOA) taught by Deputy Tom Lambrecht on March 19, 1997 at the Thirteenth TREXPO Conference on Special Tactics & Security. This unique position required that Jim be trained in scout sniper skills. 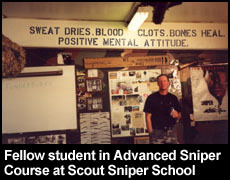 He first got his training in-house, and then later on with Scout Sniper School with Division Schools with the 1st Marine Division at MCB Camp Pendleton, California. For a call-out Jim was required to have a ghillie suit and all sniper equipment required for scouting. Although he was trained on the Remington 700 police sniper rifle (.308) and M-16 assault rifle (5.56 mm) Jim was armed with a Smith & Wesson model 642 .45 caliber semi-automatic pistol for self-defense should a suspect engage him while in close proximity to the target. In missions Officer Wagner was also subject to be placed in whatever position that was needed. 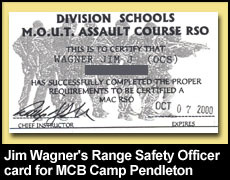 When SWAT Officer Jim Wagner received his Range Safety Officer (RSO) certification from the U.S. Marine Corps he was authorized to run and supervise live-fire sniper range training on various ranges at MCB Camp Pendleton. 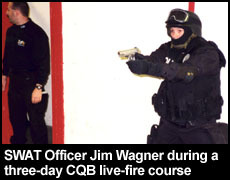 SWAT Officer Jim Wagner was authorized to attend Close Quarter Battle courses and hostage rescue courses with outside organizations. He regularly trained on the MP5 submachine gun, the M-16 assault rifle, shotgun, and pistol. On two occasions Jim Wagner, a patrol officer using his SWAT skills, would be the point-man on two different hostage rescues while on police patrol when there was not enough time to call out the SWAT Team. The Costa Mesa Police Department did not have a full-time team, but members where called out when there was an emergency or for training. On both occasions forced entry was made by Corporal Wagner and both ended satisfactory. (Report number 97-37340 occurring on October 11, 1997 and the second incident to be posted). Working closely with the Entry Team to provide bus assault data Officer Jim Wagner met with Lieutenant Goyen of the United States Army Special Operations Command South IMA Detachment 697 on May 9, 1994 to get the latest information on bus entry tactics that the Army had (a situation law enforcement was focusing on at the time). During the meeting Lieutenant Goyen gave tips on sniper tactics involving bus situations, hostage negotiations strategies, and Security Operations (SECOPS). 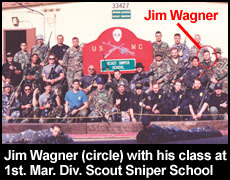 Jim had trained with Lt. Goyen and members of his team in sniper tactics in Victorville, California on March 20th and 21st, 1994. Shortly after this fact finding mission Officer Wagner met with Pam Peters of the Orange County Transit Authority (OCTA) to get bus specifications on all of the buses of Orange County (OC). Pam Peters was also a Reserve sergeant with the Orange County Sheriff’s Department Search & Rescue Unit and would convince Jim to join her department when he left the Costa Mesa Police Department in 1999. On March 15, 16, and 17, 1994 Jim Wagner went to a course titled Managing Hostage and Barricade Situations in Burbank, California taught by Ronald M. McCarthy. Ron McCarthy, well known in the United States law enforcement community, served as a Los Angeles police officer for 24 years and was with Metro Division (SWAT) for 20 years working his way up to assistant commander in 1984. From 1984 to 1986 Ron McCarthy was the chief of Tactical Operations for the U.S. Department of Energy. Jim Wagner also attended the Security Site Survey taught by Steven Mattoon and Greg Bartol. Because the SWAT Negotiations Team called upon Jim Wagner to run some realistic scenarios from time to time, and the information from them going to the Command Post in real call outs was critical, Jim had a fare amount of training in this field as well. 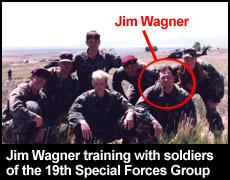 Jim Wagner also worked closely with the SWAT Intelligence Officer and was sent to a few courses in this specialty, and he also had the opportunity on more than one occasion to work with the U.S. Army 19th Special Forces Group Military Intelligence Detachment. 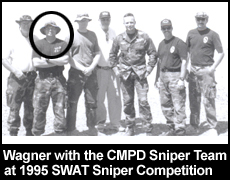 On August 14, 1995 Corporal Jim Wagner was one of several SWAT officers representing the Costa Mesa Police Department SWAT Sniper Team for the 12th Annual Fullerton Police Department “GROUP THERAPY” SWAT Sniper Competition held at the San Gabriel Valley Gun Club in Los Angeles run by Officer Neal Baldwin of the Fullerton Police Department. Officers on the team included SGT D. Birney, Officer G. Beilby, Officer D. Erber, Officer D. Freeman, and range master advisor Jack Sharnhorst. Officer Wagner and his partner were awarded a certificate as one of the TOP TWENTY SHOOTERS in the State of California. 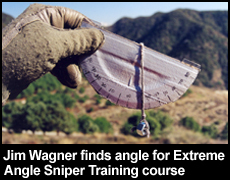 Officer Wagner used a Remington 700 police sniper rifle using a 10x scope. Officers D. Erber and D. Freeman ranked third in the state. Seventy officers and military personnel from all over the State of California participated in this competition. Like all SWAT officers Jim was required to know every piece of equipment and every inch of the Mobile Command Post, and therefore had to learn logistics. This ranged from everything from weapons storage to setting up generators and lights. Of course, SWAT Officer Jim Wagner, had to master Command Post Operations and be able to communicate and coordinate with all SWAT units. For his training Jim was sent to a tactical diagram course, an Identi-Kit course by Smith & Wesson, and various crisis management courses. Jim not only knew SWAT operations from the operator’s perspective, but from a command perspective as well giving him a tactical background that few other officers get. Officer Wagner also had the opportunity to work with the his department's Aviation Unit going up in the Hughes 500 police helicopter to do aerial photographs of the city of Costa Mesa (a time before Google Earth). He also was trained in air assault tactics by U.S. Customs Aviation in Sikorsky UH-60 Blackhawk helicopters at March Air Force Base in early 1993. The second training was a flight from March AFB over Big Bear and then some desert drop offs just beyond the mountain range. 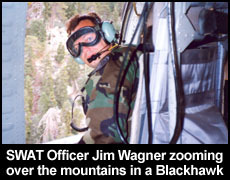 Then on September 22nd and 23rd, 1993 Jim Wagner supervised air operations training for various law enforcement agencies through his company HSS International. 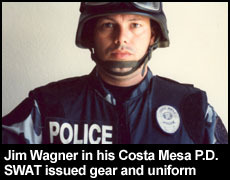 SWAT Officer Jim Wagner’s last SWAT call-out was in 1997 when the Costa Mesa Police SWAT Team surrounded an apartment building in the 500 block of Hamilton Street in Costa Mesa where six men, smugglers known as “coyotes” were holding 12 illegal immigrants hostage at gunpoint. Jim worked at the Command Post for Lieutenant Ron Smith. The incident was over rather quickly when the suspects told SWAT negotiators that they were willing to surrender. Mark Avery of the Orange County Register took a photograph of the two suspects being led away in handcuffs from the apartment that had been rented to Miguel Cetendo. 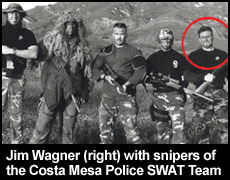 Looking back on his SWAT career Jim Wagner said, "The three years on the Costa Mesa Police SWAT team was where I first had the opportunity to use a wide variety of my skills, thanks to a few of my supervisors, and most of all Lieutenant Ron Smith who I looked up to as one of my mentors. I was the most cross trained person on the SWAT Team, which although caused some friction with some of my fellow team members, it gave me the experience and skills that I would use later to train other units and agencies." "Most people make the mistake, especially civilians, of thinking that SWAT is more dangerous than patrol, and sometimes it can be. However, the average street cop in a big city experiences violent situations as they unfold or when crimes are in progress. They are usually much more fluid and unpredictable. By the time a SWAT team arrives, most of the time, the situation is contained by a police perimeter and a SWAT team goes in for a surgical strike. However, statistically most suspects surrender before an Entry Team goes in, or before a sniper is authorized to take his shot, because they know that eventually the SWAT team will win and control the situation. As a police patrol officer I have been in dozens of life and death situations, and I give my SWAT training credit for making me a better police officer, and then a better deputy Sheriff, and then a better United States Federal Air Marshal, and then a better soldier." Jim said.